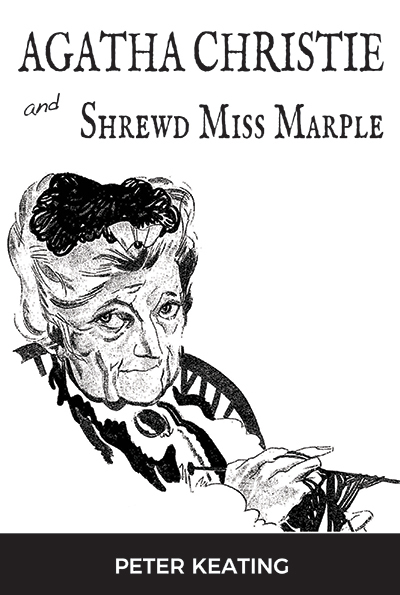 Miss Jane Marple made her literary debut in the aftermath of Agatha Christie’s notorious disappearance. She owes not only her existence to that cathartic event in Christie’s life but virtually every aspect of her personality as well, so closely were character and author linked to each other. For me, this relationship was the starting point of what has been a long and fascinating study, complicated, as any serious study of Christie is bound to be, by the bewildering fact that she is an author who has always been hugely read and admired and, at one and the same time, all but totally ignored critically. So great was this neglect that at the beginning I couldn’t even find sufficient bibliographical information about Christie’s early publications for me to establish in any reliable way when and how Miss Marple first appeared in print. It was something that took quite a lot of sorting out. But the complex process is now presented in full in Agatha Christie and Shrewd Miss Marple. It provides the essential starting point for an exploration of the impact Miss Marple had on Christie’s life and work from that traumatic beginning, through a long period of uncertainty in which for many years Christie was unwilling, or unable, to write about Miss Marple at all, to the deeper unity between author and character revealed in the final trilogy of Miss Marple novels written towards the end of Christie’s life. Perhaps the most surprising result of the critical neglect suffered for so long by Christie is a widespread unwillingness to read what she actually wrote. In part, this relates to the familiar patronising view that she has little to offer apart from ingenious riddles, but there is an apparently more positive explanation as well. After a slow beginning, there has been a phenomenal growth of television and film adaptations of Christie novels. This has contributed hugely to her world-wide fame as a writer. But unfortunately, and however successful they may or may not seem to have been on the screen, Christie’s narrative skills are very often transformed or distorted in ways that reflect badly on the books themselves. The result is that the viewer often emerges from the experience with little true sense of the story, let alone the tone, of Christie’s novels. In Agatha Christie and Shrewd Miss Marple, I look in detail at only one example of this kind of adaptation, Poirot’s Murder on the Orient Express. My purpose is not to condemn either of the two film versions made of this novel, but to show how even sensitive and sympathetic adaptations can move spectacularly away from a Christie text. Clearly, Christie’s novels deserve to be read with more care. Perhaps the main reason why I have been constantly turning up new things in the novels is that my approach has been that of a literary historian with a personal interest in psychoanalysis. So great is the general misunderstanding of just what kind of author Agatha Christie is, that these three areas of interest - literary, social historical, and Freudian – would usually not be considered to be of much help in appreciating her skills as a writer of superlative murder mysteries. But as demonstrated repeatedly in Agatha Christie and Shrewd Miss Marple, that common assumption is entirely false. Once again, we are brought solidly up against the bewilderingly ill-informed, intransigent attitudes that Christie’s work has always had to combat. Miss Marple herself I have also tried to present with a fresh image. She has very often been regarded as trailing some way in the literary detective stakes behind her great rival Hercule Poirot, and understandably so. After all, it is Poirot who stars in most of Christie’s classic mysteries. His are the fictional cases that have given Christie such a dominant place in the standard histories of detective fiction. Even so, this does not mean that the Miss Marple novels are inferior to Poirot’s: simply that they are consciously different. And not only that, but different in a variety of ways which it has been a main aim of Agatha Christie and Shrewd Miss Marple to explore. Nor are other kinds of interest in Miss Marple ignored. For those admirers of Christie who are fascinated by the imaginative topography of the novels and who fancy trying to visit Miss Marple’s home village of St. Mary Mead, the precise location of which has itself been a long-standing mystery, the book also offers a surprising suggestion where, nowadays, they might go to look for it.